It's no secret I love Pinterest. I stalk it, browse it on almost a daily basis, looking for my next project. I found one easily to replace those tacky, cheap cardboard calendars with the nasty chocolate inside. Simple bags with simple tags. Step 1: I used the 3" paper shapers scalloped edge punch in red for the outside. Step: 3: Cut about 40 or so holly leaves using the Martha Stewart Punch. I had these pre-puncjed for another project, so this step was easy! Step 4: Using Cricut Expression and the Plantin Schoolbook cartridge, I cut 1.5" numbers in red, 1 - 24. Step: 5: With your adhesive, layer the green circle centered on the red scallop, and then the white circle on the green. The numbers go centered on the white last. 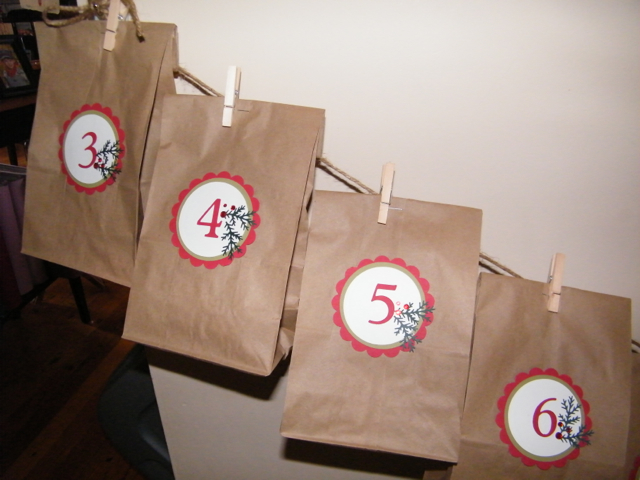 Step 6: add the holly leaves, one or two around the numbers along with some Kaisercraft rhinestones in red. Step 7: Center on the front of a brown lunch bag and fill with treats. I hung these using clothespins and some twine hung from command hooks. 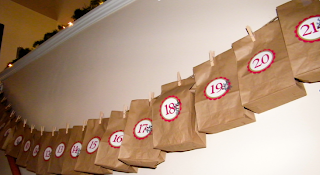 (Aren't command hooks awesome for Christmas?!). 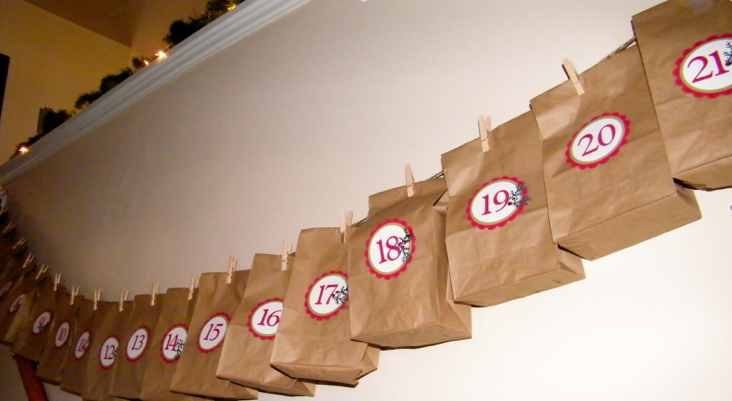 We are only on day three of opening our "Countdown to Christmas" advent bags, and the kids are loving it. They take turns opening, oldest to youngest. Today is Josh's turn. I'm saving the bags for next year. This is definitely the start of a new tradition!